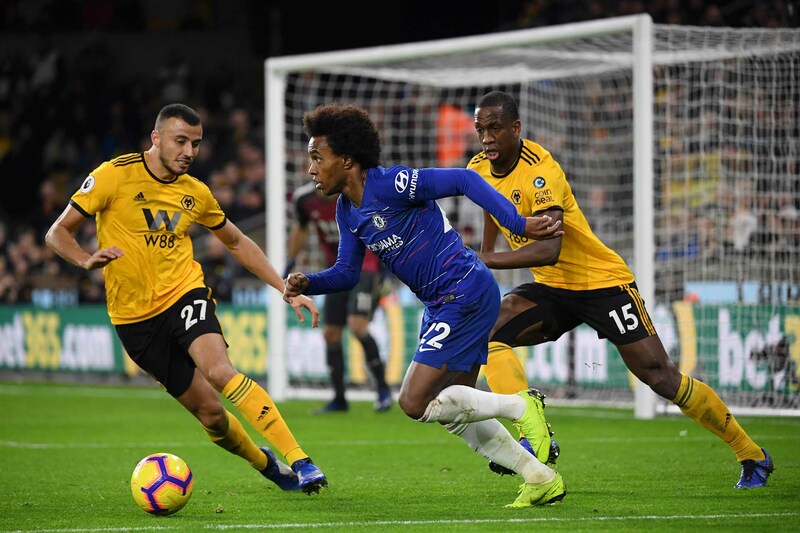 Willian in action while under pressure from Romain Saiss of Wolverhampton Wanderers and Willy Boly of Wolverhampton Wanderers during the Premier League match between Wolverhampton Wanderers and Chelsea FC at Molineux on December 4, 2018 in Wolverhampton. If the pressure wasn’t already beginning to mount on Maurizio Sarri, Wednesday’s match against Wolverhampton Wanderers did him absolutely no favours. A four-minute spell of chaos saw Chelsea lose their collective minds and concede two goals that would ultimately cancel out Chelsea’s first-half lead. Sarri was left to ponder how his side completely lost their way after both of Wolves goals, and he’ll have to come up with the answers very quickly, as Chelsea host Manchester City on Saturday. To be fair, though, Wolves are capable of this level of performance. Against teams around them, they haven’t performed particularly well, but their style of football has so far frustrated all of the members of the top five, with either narrow defeats or draws being the result. On Wednesday, Wolves found that magic in the second half, though it was hard to see that happening after the first half. Chelsea were far better in the first half, but even the opening goal had a bit of good fortune to it. Ruben Loftus-Cheek made his first Premier League start against Wolves, and it was his shot that deflected off Conor Coady’s head and past Rui Patricio to give the visitors the lead. Willian seemed the liveliest player for Chelsea in the first half, forcing Rui Patricio to tip a vicious free kick onto the bar and threatening with runs in behind. Chelsea started to pick up a bit of steam in the second half and could have had a penalty when Alvaro Morata tried to bundle in a cross from Loftus-Cheek only for Willy Boly to possibly swept Morata’s legs out from under him. Wolves found their intensity as soon as they began to feel hard done by some of Jonathan Moss’ whistles. At their best, Wolves are a side that do close down quickly and stay tight, but a collection of yellow cards and whistles for fouls seemed to leave them aggrieved, and Wolves’ players seemed intent on putting things right. Just before the hour-mark, Morgan Gibbs-White found Raul Jimenez running through a gap down the right, and Jimenez took the pass in stride and powered his shot underneath Kepa Arrizabalaga to give Wolves the equaliser. T the temperature in Molineux Stadium rose once again after bookings were issued to Romain Saiss for a foul and Conor Coady for dissent had Wolves supporters feeling aggrieved. A minute later, Joao Moutinho, who was already on a booking, stepped in front of Willian inside the Chelsea half. Willian, feeling he was pulled back and Moutinho should be collecting his second yellow card of the evening, stopped to protest the foul, but Moss let play continue. Moutinho, still carrying the ball after winning it from Willian, slipped a pass to Matt Doherty behind Marcos Alonso, and Doherty’s cross flashed across goal toward Jota for a tap-in that gave Wolves the lead. Chelsea players surrounded referee Moss to complain about the possible foul on Willian with Cesc Fabregas being booked for dissent. They never regained their composure, and Chelsea looked as if they ran out of ideas and never recovered any sort of spark to suggest any comeback was going to happen.